These little red black spotted beetles are well known, but did you know it's the larvae that create havoc among pest populations? The adults eat a few as they look around for a good burgeoning group of aphids or other pests to lay their eggs among. The larvae look nothing at all like the adults; they resemble tiny charcoal grey alligators, and busily chomp away on the pests. 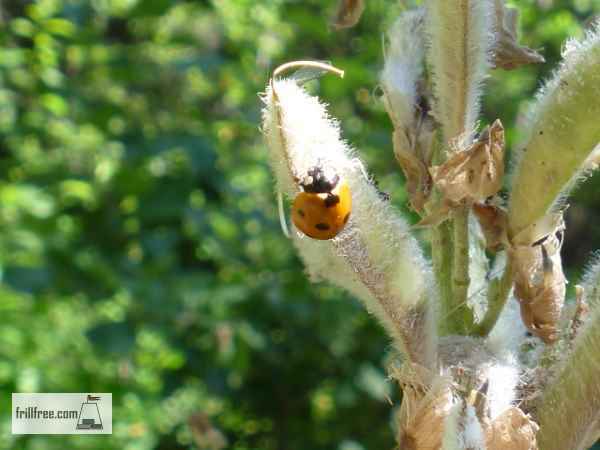 The eggs of the ladybug are bright yellow, so if you have an infestation on your garden plants, check to see if the ladybugs have got there first. The eggs are laid in a cluster, generally three to six or seven together, and I've seen as many as three larvae on a plant, so I imagine that the first ones to hatch out get the good stuff, and the later ones have to try and locate another population to predate. The larvae have been referred to as 'garden alligators' as that's what they most resemble - they look nothing like the adults with their red spotted wing cases. It's a good idea to let some of your weeds grow undisturbed in a quiet corner of your garden - I know, the domesticated gene rebels against leaving weeds, but these are some of the best fodder for many beneficial insects, including syrphid flies, wasps and many other predators. They need nectar and pollen to complete their life cycle, not just pests to eat.